The British Horseracing Authority (BHA) has announced the appointment of David Sykes to the newly created role of Director of Equine Health and Welfare. 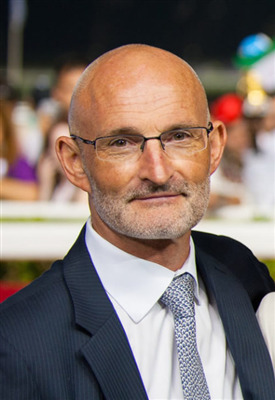 BEVA Member David joins the BHA from the United Arab Emirates (UAE) where he has held the position of Head Veterinary Officer for the Emirates Racing Authority (ERA) since 2010, a role which encompasses the welfare and integrity of all flat racing in the UAE. In this role he was responsible for implementing and managing anti­doping and medication control programs, equine welfare and health issues, administration of data collection programs for injury surveillance and risk factors associated with racing in the UAE. In addition, David has held the role of Head of the Veterinary Department for the UAE itself since October 2015, which includes responsibilities for Government liaison, quarantine and import/export controls and testing. Prior to his time at the ERA Regulatory and UAE Equine Quarantine positions, David held positions in Sydney, Australia, his country of birth and where he established a successful five-veterinarian practice. As well as his regulatory positions, David brings over 20 years of private practice experience to the role. David joins the BHA in March, with the exact date to be confirmed. “I regard British racing to be unique in its quality and diversity and the BHA as a world leader in equine health and welfare issues. I look forward to immersing myself in this position and, in consultation with the industry, further developing whole-of-life racehorse welfare strategies”. The creation of the new Director of Equine Health and Welfare role reflects the importance of equine welfare to the BHA and the racing industry. Providing equine welfare leadership is a strategic priority for the BHA, as outlined in its recently published business plan. The new role is an enhanced position which replaces the previous Chief Veterinary Officer role. It will report to the Chief Regulatory Officer and become a member of the BHA executive team. Priorities for the BHA, and the new Director of Equine Health and Welfare, include: enhancing the leadership and capability of the BHA’s equine health and welfare function; improving the capture, analysis and benchmarking of racehorse welfare information; and continuing to develop the BHA’s equine welfare strategy. David will also be an important figurehead of the sport’s “The Horse Comes First” welfare campaign. “We’re excited to have someone of David’s proven veterinary and regulatory experience joining the organisation at a time when we have made it clear that equine welfare leadership is our top priority. David was the outstanding candidate from an exceptionally strong field of applications for what is an exciting role in a position of global importance in the world of racing.